We weren’t originally planning on going to the Sunshine Coast, but decided to go when our friend Mira insisted it would be worth it. 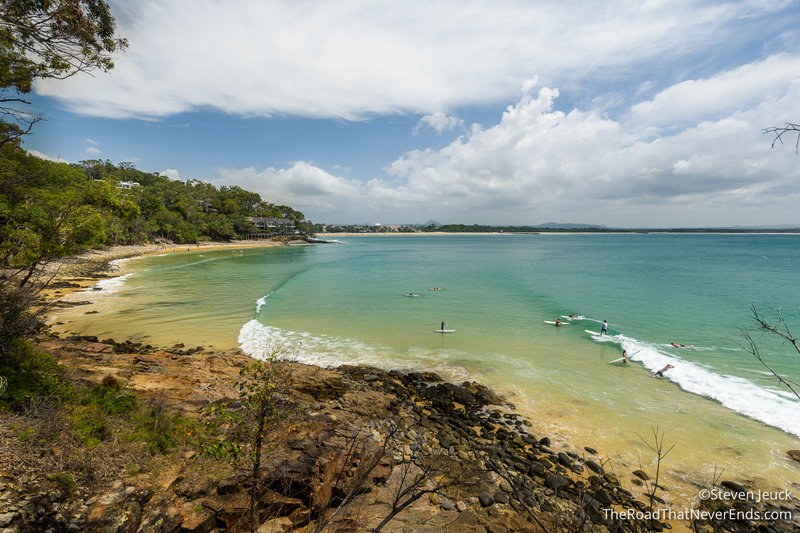 The Sunshine Coast is located in Queensland, and a popular getaway destination for Australians seeking beach, and nature. We ended the trip with an overnight stay in the Gold Coast to visit our friend, Mira. The Sunshine Coast and Gold Coast are drastically different. The Sunshine Coast had a nice, outdoorsy, slow vibe; whereas the Gold Coast reminded us of Miami Beach Florida – clubs, shopping, with Orlando like attractions (theme parks, wax museums, etc.). From Sydney, we flew via TigerAir to Brisbane. There are direct flights to Sunshine Coast and Gold Coast, but since we didn’t originally plan on going there, we had booked a flight to Brisbane for pretty cheap. We had rented a car at the airport through Enterprise, and it was a much better car than the Fiat in Sydney. We arrived at 9AM, and since we had some time to kill, even drove to a nearby mall to look for some electronics we needed. Driving in Brisbane was pretty easy, in fact, they have a tunnel that runs through most of the city to the airport. We did get lost for a minute when the GPS lost track of where we were. The drive to the Sunshine Coast was about 2 hours. According to Steve, it reminded him of our driving adventures in Florida. I slept through the ride. Driving throughout Sunshine was easy; the roads were easy. The only challenge was finding parking when we went to Noosa. In the Sunshine Coast we booked a cheap motel in Coolum, called Beach Retreat Coolum. What made it more awesome than the cheap price, was how close it was to the beach. We only had to walk across the street to get to the beach. The little town had plenty of great restaurants making this a really nice choice to stay when visiting the area. We did stay overnight at the Gold Coast in a cheap motel, The Miami Motel. From the outside, it looked quite dumpy, but the rooms were actually quite nice on the inside. On our first day in Sunshine, we had to take advantage of the beach, so we did. Beach naps has always been my thing. The water was much warmer than down in the Ocean Road, and was a lot of fun to body surf. We were stoked the motel had beach towels to rent for $5 for your entire stay! The beach towels were actually big enough to lay on them, unlike our quick dry towels. We ended our night with a fried fish feed at a local fish and chips spot. It was delicious! 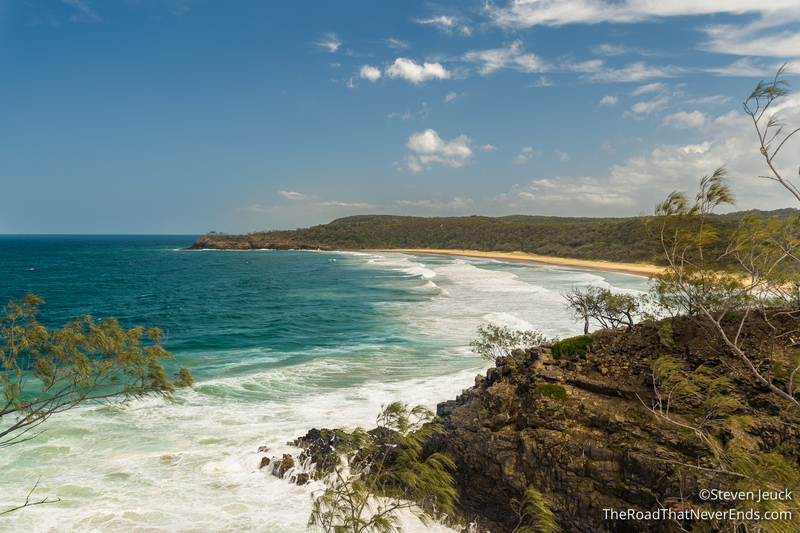 The next morning, we drove to Noosa National Park, only a 20-minute drive from our hotel. I realized Steve was correct, driving here was exactly like driving through Florida. When we arrived, we found parking was extremely challenging, especially for a Tuesday. We ended up parking over a mile away from the park and walked to the park. 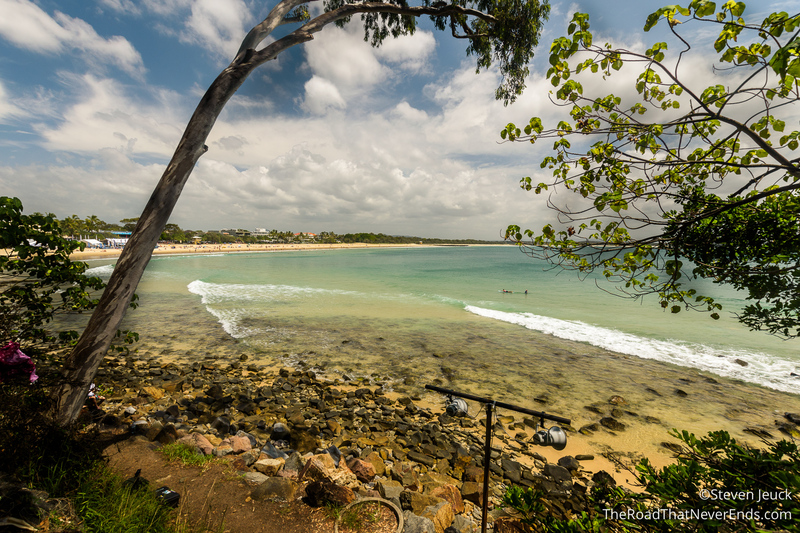 The park has a beach attached, Noosa Beach, and we saw it was completely crowded. We had brought our swimsuits and towels, but weren’t sure where we would find a spot. We found out that there was a surf competition that week, and they were in the middle of doing their “Hang 10” trials. Steve and I watched a bit, it was incredible. We decided to head to the National Park and hit the trails. We decided to do the coastal trail, which the guide told us would take us 90 minutes to 2 hours. We stopped along the way for photos, including Hell’s Gate and Dolphin Point. We didn’t see any wildlife on this hike which really surprised us, but considering how crowded the park was maybe we shouldn’t have been. We did see a turtle swimming in the currents, but he was so far, we couldn’t really get a photo. After our hike, we were hot, sweaty and hungry. We stopped for lunch at Betty’s Burgers which made great burgers and sandwiches… and having a cold beer was nice too. We decided to head back to our hotel, and enjoy our beach again since the Noosa Beach was jam packed with people. We made it to the beach around 3, and decided to pick a spot near the lifeguard sign. We noticed their sign had updated weather, water conditions, and a warning for “Blue Bottles”. We weren’t really sure what Blue Bottles were, maybe trash? We walked towards the water and we saw what it was, hundreds of small beached jellyfish. A local saw us and said to be careful because they can still sting even on the beach, and there are people getting stung in the water. Well, if you don’t know, a few years ago I went to Hawaii and was stung by a jellyfish there in the water. The little nasty thing wrapped around by ankle and foot. I had to take Benadryl that night to help with the pain and swelling, and a week later the swelling and rash started again. A trip to the doctor indicated I was allergic to whatever stung me and needed to take steroids. Well, one trip to an Australian hospital was enough for me, so I told Steve I would wait on the beach for him. As if the lifeguards were watching our contemplation, they made an announcement on the speaker saying Blue Bottle Jellyfish are out and about in the water and several people had been treated for stings. Still, there seemed to be 50 people still in the water. Steve suggested we go swim at the pool in our hotel, and I thought that was a grand idea! 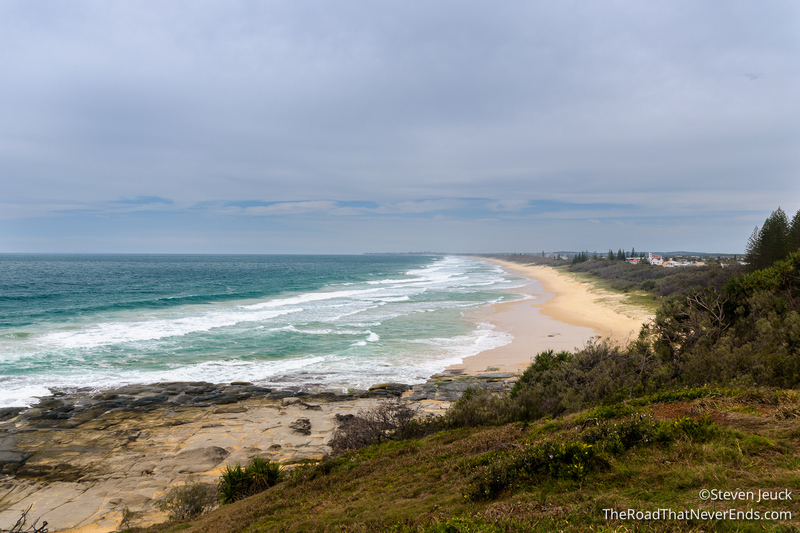 The next morning, we drove down the coast towards the Gold Coast. We stopped at several places for quick walks and picture opportunities. Although the weather was cloudy and overcast, we really did see enjoy checking out beaches and even an old Lighthouse. We arrived at the Gold Coast around 3, and were shocked at how different it was from Sunshine. We were now in the hustle and bustle of a city. 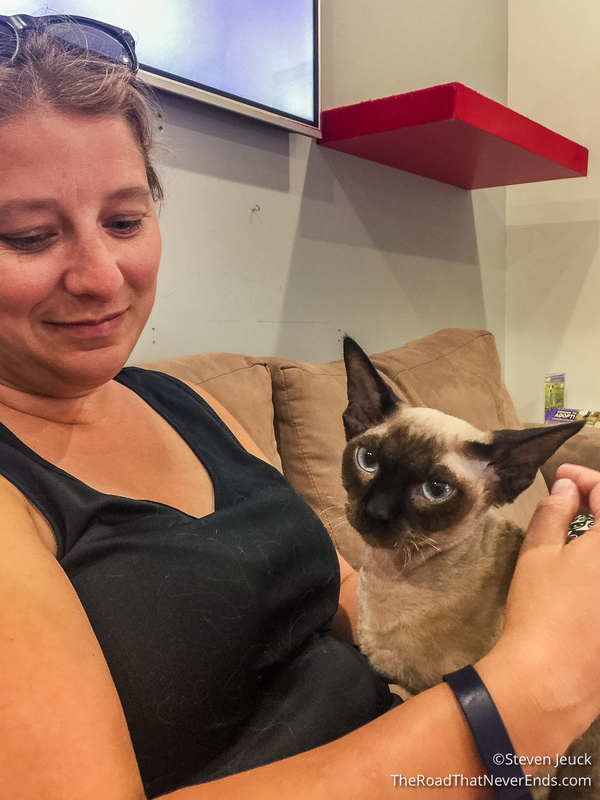 Our first stop was Crazy Cat Cafe. We have been missing our cats and thought it would be nice to have some kitty cuddles. We did an hour here, and had so much fun. 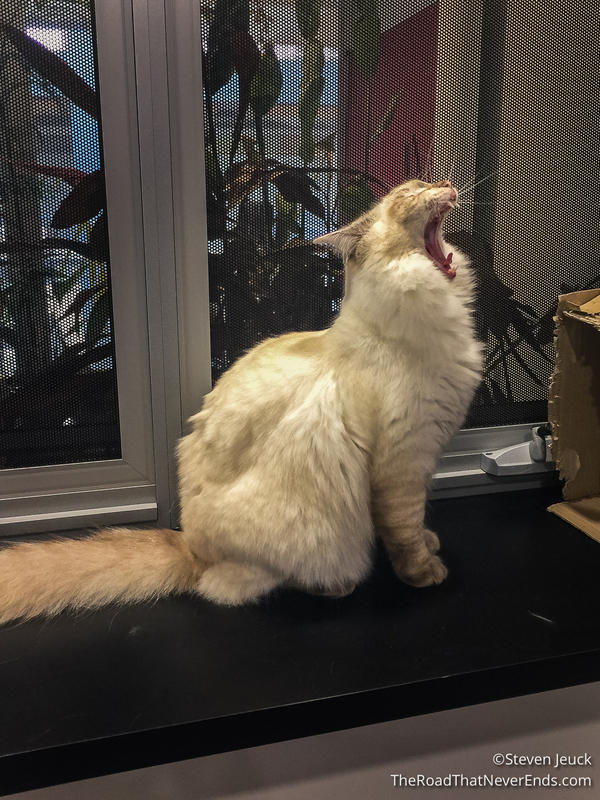 Our favorite cats are: Jerry (super playful) and Pete (extra cuddly). 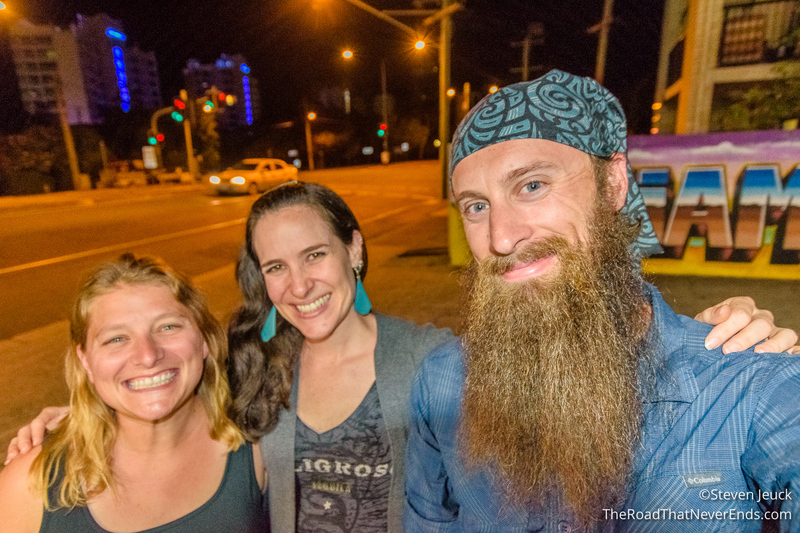 We went to the Gold Coast to see our friend Mira and after she got off work we met up for dinner. It was so great to see a familiar face. 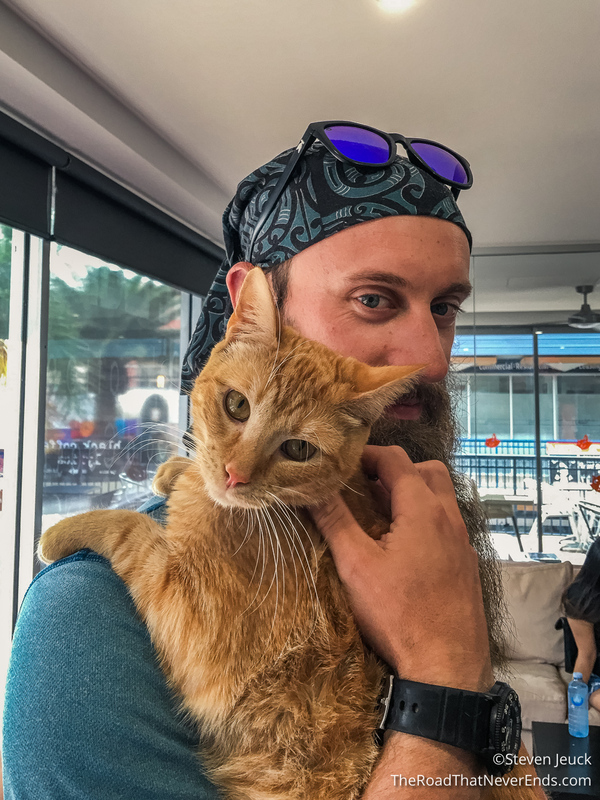 Mira has been living in Australia for a while, and has been incredibly helpful with our travel plans and Aussie related questions. She took us to an Arepas place and it instantly brought back memories of Arepas in Columbia (Steve’s favorite food). We had a great time catching up with Mira, we only wish we could’ve spent more time with her and her boyfriend Jono. Mira – thanks again for meeting with us!!! And just like that, our quick trip to the coast was done, and we headed back to Brisbane.